Two fisheries settlements in 1989 and 1992 granted Māori control over one-third of New Zealand’s commercial fisheries. The Māori Fisheries Commission was set up in 1989 to aid Māori entry into the fishing industry, and to decide how to allocate fishery assets to tribes. Allocation was hotly debated for over a decade, but was finalised with the passing of the Māori Fisheries Act 2004. Tribal coastline and numbers of members were factored into the allocation of deep-sea fisheries. Half the settlement assets ($300 million in quota) were allocated to tribes, and the assets of the Treaty of Waitangi Fisheries Commission – $300 million – were allocated to a new company, Aotearoa Fisheries Limited (AFL). 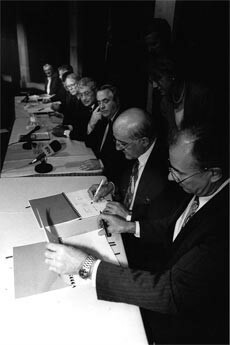 The signing of the Māori commercial fisheries settlement, September 1992. From right: Don McKinnon, Tipene O'Regan, Doug Graham, and others who had been involved in the negotiations. Photograph by Michael Smith, Dominion Post Collection, National Library of New Zealand Te Puna Mātauranga o Aotearoa, Alexander Turnbull Library, Wellington. Report back to the Hui a Iwi as to what is in place. They then received a further mandate to negotiate on behalf of Ngati Tuwharetoa and to set up the settlement Entity to receive the fisheries settlement assets. Ngati Tuwharetoa Fisheries Charitable Trust, the Mandated Iwi Organisation (MIO), and Ngati Tuwharetoa Fisheries Holdings Limited, the Asset Holding Company (AHC), were established. Transitional Trustees from the Tuwharetoa Marine Fisheries Committee – with a limited mandate. The first Election of trustees was held in 2009. 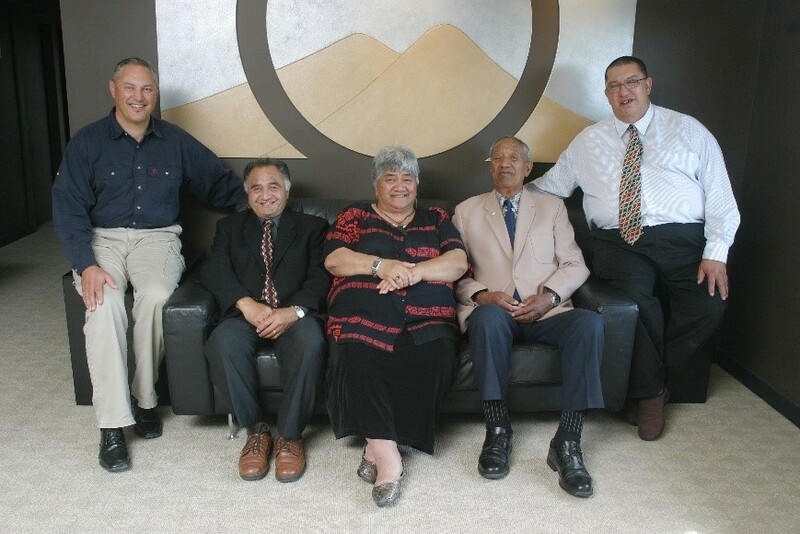 The transitional trustees during 2006-2009: (pictured from left to right) Anthony Olsen, Te Kanawa Pitiroi, Emily Rameka, Howard Kahura, and Arapiu Seymour.